Every day throughout the world over a billion people rely heavily on Australian inventions. Every time they drive a car, fly, prepare a meal, use a laptop or smartphone or spend some time in hospital there is a good chance they are relying on Australian inventions or discoveries. Then you ask people what Australia is famous for and the say “sport”. But fortunately that does not include you dear reader, because we know people visit the White Hat website because they are Intelligent and Informed. Despite its short history since European settlement and relatively small population, Australia has generated a remarkable number of important inventions in the last 200 years. In the areas of invention, the sciences and medical research (For those that like to do comparisons then you could compare and contrast Australia's inventive output with say the inventive output of the state of Florida in the USA or Portugal in Europe both of which have roughly the same cumulative population over that period.) Australia has achieved at a level well above what would be expected for a country of its population. Below is a list of a number of inventions that White Hat considers significant. Stone tools - Aboriginal people are thought to be the first to use ground edges on stone cutting tools and the first to use stone tools to grind seeds. Boomerang - a throwing stick used for many purposes whose design allows it to return to the (skilled) thrower. Woomera - a spear throwing holder that acts as an extension of the arm thus allowing greater power and range for the spear. "Woomera" was adopted as an appropriate name for the rocket launching range and associated settlement in outback South Australia. Didgeridoo - a musical instrument whose sound is immediately recognisable. It first appeared 2,000 or more years ago and at the time of European arrival was used in the north western corner of Australia. 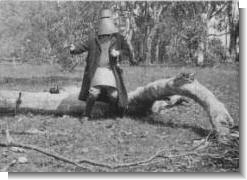 The stump-jump plough - developed by Richard and Clarence Smith in 1876. Its design allowed it to jump over stumps and other obstructions without breaking the ploughshare. The Combine Harvester (later called the 'Sunshine Harvester') - which both stripped and collected the grain was developed by Hugh Victor McKay of Drummartin, Victoria in 1882. It advanced the earlier stripper which had been developed by John Ridley and John Bull of South Australia. (see more information at Who Was the Inventor?) In 1916 Headlie Taylor of Henty designed and built a header harvester that could remove the heads from grain which had been flattened by adverse weather. 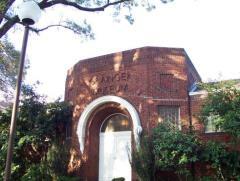 H.V.McKay was now a successful industrialist and manufactured Taylor's improved design in the McKay factories. Many superior varieties of produce including Federation Wheat and the Granny Smith Apple. 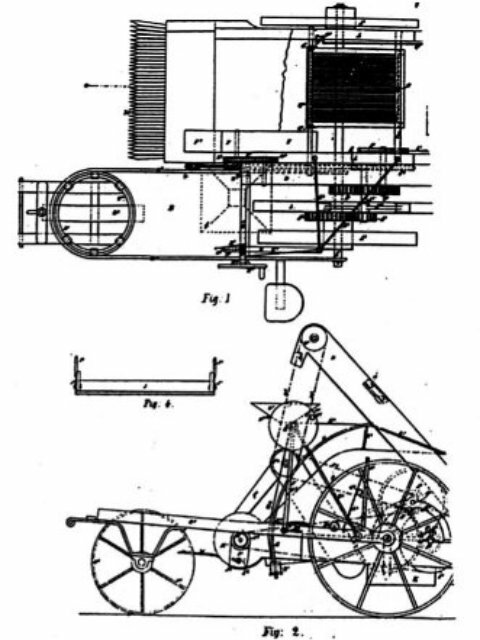 The Self-Propelled Rotary Hoe - In 1912 Cliff Howard of Gilgandra invented a machine with rotating hoe blades on an axle that simultaneously hoed the ground and pulled the machine forward. You can now find rotary hoes in back yards and small farms throughout the world and for many years the manufacture and export of the Rotovator hoe helped spread this invention across the globe. Cliff was aged 16 when he invented his rotary hoe. Permaculture - an integrated system of sustainable environmental use of land adaptable to a large number of environments to provide shelter, food and human habitat developed by Dr Bill Mollison from the 1970s onwards. The world's first pneumatic broadacre air seeder was invented and patented by Albert Fuss in 1956. It was first used that same year to sow wheat near Dalby in Queensland. The patented technology is now used internationally. The tank-bred tuna system invented by Clean Seas Tuna of Port Augusta was selected by Time magazine as the second best invention of 2009 beating competitors such as the electric eye, an AIDS vaccine, and controller-free gaming. First prize went to the NASA's Ares 1 rocket. 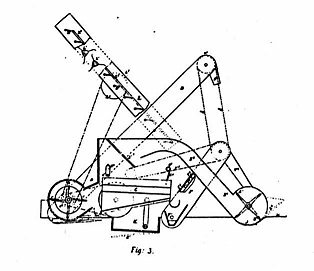 The Box Kite (or cellular kite) invented by William Hargrave in the early 1890s during his investigation into the lifting properties of curved surfaces. Hargrave's work was to form the basis of much manned flight that followed. Hargraves himself flew 16 feet on 12 November 1894 by linking a group of such kites together and adding a seat. Wave Piercing Catamaran - designed by Sydney naval architect Phillip Hercus. His design went on to form the basis for the ocean going catamarans produced by Incat in Tasmania. Australia's leadership in the design of multi-hulled vessels continued with the launch in 2005 of first commercial aluminium trimaran, the Benchijigua Express, designed by a team of engineers in Perth led by Dr Tony Armstrong. The 'Diff' (differential gears) - David Shearer designed a differential gear which he incorporated into the steam car he built in South Australia in 1897. The 'Ute' - A vehicle with the cabin of a sedan car (unlike the larger 'pickup truck' which was to develop in the USA) and the rear of a small truck was designed by Lewis Brandt at the Ford Motor Company in Geelong, Victoria.1934 and called a 'Utility Vehicle'. The 'ute' has long been a favourite vehicle for farmers and tradesmen and is part of the Australian landscape and in particular becomes the centre of attention at 'ute musters'. 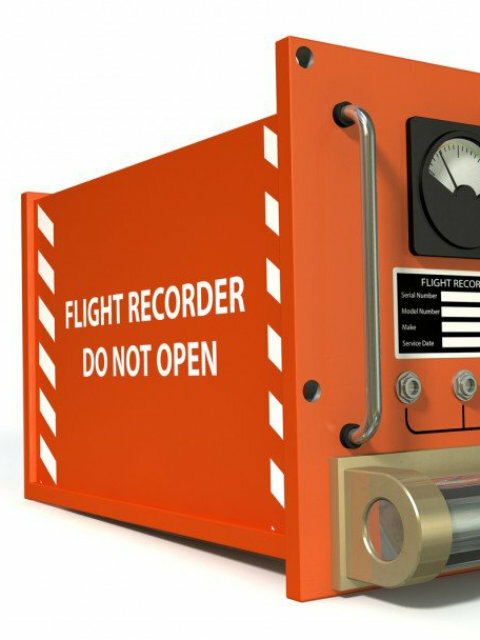 Black Box Flight Recorder - this famous device was invented in 1958 by Dr David Warren at the Aeronautical Research Laboratories in Melbourne. The Inflatable Aircraft Escape Slide & Raft was invented by Jack Grant while working for Qantas in 1965. It is now standard safety equipment on most passenger airliners in the world. Variable Ratio Rack & Pinion Steering - invented by the engineer Arthur Bishop in 1970. This was quickly adopted by vehicle manufacturers throughout the world. The Zeta Platform, a global drive architecture for rear wheel drive vehicles, was developed by a Melbourne engineering team led by Tony Hyde. It is expected to be used in all GM rear wheel drive vehicles produced throughout the world. The Deakin T2 (T squared) Car - When the Ford Motor Company issued a challenge to design "A T Model Ford for the 21st century" to celebrate the centenary of the original, the joint winners were a team from Deakin University in Geelong and a team from Aachen University of Cologne in Germany. Read more about the Deakin T2 (T squared) Car. Hills Hoist - the rotary washing line with hoist quickly became and remains a fixture in Australian back yards. The original rotary clothes hoist had been designed by Gilbert Toyne in Geelong in 1912, but Lance Hill of Adelaide further developed the design from 1945 onwards and marketed it under the name of the Hills Hoist. 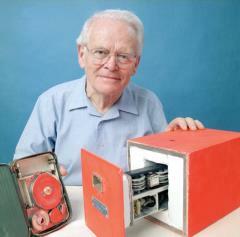 He later added and patented the winding mechanism in 1956. The Electric Drill - was patented by Melbourne inventor Arthur James in 1889. Kiwi Shoe Polish - invented by Melbourne businessman William Ramsay together with his partner Hamilton McKellan in 1904 and launched as 'Kiwi' in 1906, this soon became and still remains the most successful shoe polish in the world. He chose the word 'Kiwi' because of his New Zealand wife. The Two Stroke Lawn Mower - developed in Australia in 1930. Both the two stroke mower and the Hills Hoist featured in the opening ceremony of the Olympic Games in Sydney in 2000. Latex Gloves - developed in Australia in 1945. Telephane - This invention which used telegraph lines to transmit visual information was an important precursor to television. 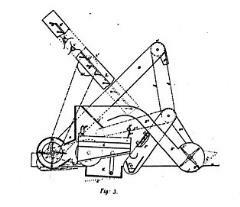 It was invented by Henry Sutton in Ballarat in 1885. The Record Changer - The centre spindle designed by Tasmanian Eric Waterworth in 1925 for the 'Salonola' record player was soon adopted for use in record changers throughout the world. In 1932 R. M. Williams designed a pair of elastic sided boots suitable for use by stockmen. Although not the first boot of this kind, Williams' classic design and workmanship soon established its reputation. Variants of this design of elastic sided work boot are now sold around the world as The Australian Boot. Shepherd's Castors - the dome shaped castors invented by George Shepherd in 1946 soon became the world standard. Aerogard Insect Repellent - the essential ingredient to this famous insect repellent was invented by the entomologist Dr Doug Waterhouse at the CSIRO in 1963. He revealed the formula to representatives of the Mortein company who patented it and made substantial returns from the sale of the product. The garage roller door in the form of a rolling overhead metal door was first produced by B&D in 1956 and soon became an icon of Australian suburbia. It is now exported to or produced under licence in a number of countries throughout the world. White Hat is still attempting to verify whether this style of door can legitimately be claimed as an Australian invention. The technique for salt water chlorination of domestic swimming pools was invented by the Australian scientist Len David in his back shed in the 1960s. It is regarded by many as a safer, more sustainable approach than conventional chlorination and requires much less maintenance. It was released commercially in Australia in the 1970s where it spread rapidly then in later decades taken up by other countries around the world, particularly the USA. Xerox Photocopying - the technology behind xerography was developed at The University of Sydney by Professor O U Vonwiller in 1907. Polymer Bank Notes - the Australian-invented technology used in producing polymer bank notes is now licensed in many countries throughout the world. In addition, Australia currently produces bank notes for export to 18 countries. Blast Glass (also known as Stop Shot). A ballistic and blast resistant glass system. Unlike conventional bullet proof glass it incorporates an air cavity to help absorb the shock wave of explosions. It almost certainly saved many lives in the terrorist bombing of the Australian Embassy in Djakarta in 2004. Invented by Peter Stephinson. 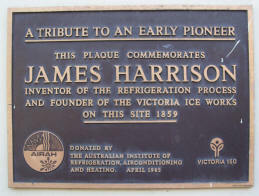 Refrigeration - The first mechanical refrigeration plant was built by James Harrison in the 1850s. Despite the plaque in Melbourne (see right) we believe Harrison's first ice works were at Rocky Point on the Barwon River in Geelong. Vegemite - this peculiarly Australian foodstuff created from waste brewers yeast was invented by Dr Cyril Callister and launched by the food entrepreneur, Fred Walker in 1923. See also Who Invented Vegemite? Wine Cask - the flexible bag inside a box was first developed by Thomas Angove of South Australia in 1965 and later given the now familiar tap by Penfolds Wines and brought to market by Sam Wynn of Wynnvale Wines. This design has now become almost universal. Zip Instant Boiling Water Heater - In 1975, engineers at Zip designed and patented the first instant boiling water heater in which the steam is ingeniously recycled to heat the incoming cold water thus creating a highly energy efficient system. Since then Zip water heaters have been exported to large numbers of countries and have become a standard fixture in many staff rooms and catering organisations throughout the world. The Vertically Integrated Migration Service - in the mid 19th century Caroline Chisholm together with her husband set up a private migration support system from the UK to Australia. This included recruitment and education of potential migrants in England and Ireland, preparation and education for their arrival in Australia, overseeing of the humanitarian and health conditions on the transport ships, a loans system to help families establish themselves, and employment and placement services when the migrants arrived in Australia all within a business model that made the operation sustainable. This remarkable achievement would still put to shame the services provided by many governments and wealthy NGOs throughout the world today. The Australian Ballot (Secret Ballot) - the system of casting one's political (or other) vote in a manner that is private and confidential on an anonymous ballot paper. Until the mid 19th century, voting for public office was publicly displayed which left the voter open to intimidation and/or bribery. A secret ballot system was invented by Henry Chapman of Melbourne in 1855 and within a short time of each other in 1856, both the colonies of South Australia and Victoria created a secret ballot system which became known around the world as the Australian Ballot. These Australian colonies were followed at considerable distance by New Zealand in 1870, the UK in 1872, Canada in 1874 and eventually the first presidential election in USA to use Australian Ballot was in 1892. Today the right to a secret ballot as a protection against coercion and intimidation is accepted as a cornerstone for any democratic state or institution. Australia has been one of the pioneers of democratic rights. Although Australia was not the first country to have votes for women, it was amongst the first (see this table from the Australian Federal Government web site) and certainly the first to grant women both the right to vote AND the right to sit (first at colony level in South Australia in 1894 then at national level in 1902). Votes for women were granted in South Australia in 1894, Western Australia in 1899, New South Wales in 1902 and Victoria in 1908. The sustained establishment of the Eight Hour Day (or 48 hour working week) was finally achieved in Melbourne in 1856 by a group of skilled tradesmen and small business operators led by James Galloway and James Stephens. This movement was a precursor to the union movement and the condition were later to expand to include both skilled or unskilled employees. Although the 8 hour days had been temporarily achieved in both New Zealand and America at earlier times, they were not sustained, so the Australian movement was seen as a particularly significant since this is where it 'took root'. The 6 day working week was later reduced to 5½ and by the 1950s had mainly changed to a 5 day week and the standard working week for most employees had reduced to 40 hours. The National Integrity System, often called The Queensland Model, is acknowledged by just about every country around the world as well as by the United Nations and the World Bank as the benchmark approach for reducing corruption in public affairs. In the 1980s the Fitzgerald Inquiry in Queensland came up with a large number of recommendations for controlling corruption. New Zealand lawyer Jeremy Pope, founder of Transparency International, organised these recommendations into a 'system' which he called The National Integrity System. In the 1930s Sister Elizabeth Kenny, a bush nurse working in country New South Wales and Queensland, developed a radically new and controversial method of treating children with polio. Her work went on to be internationally acclaimed and is regarded as providing important foundations to the discipline now known as physiotherapy. The life saving application of penicillin was developed by Howard Florey and his team (see more information at Who Was the Inventor?). Penicillin has saved millions of lives world wide. In 1948 Dr John Cade, a Melbourne psychiatrist, discovered the use of lithium carbonate (usually just referred to as lithium) in the treatment of bipolar and similar disorders. Many firsts associated with in vitro fertilisation, including the birth of the first frozen embryo baby at the Queen Victoria Medical Centre in Melbourne 1984. The Bionic Ear- the cochlear implant was invented by a team led by Professor Graeme Clark at The University of Melbourne and in 1978 the first person received the implant at the Royal Victorian Eye and Ear Hospital. (see more information at Who Was the Inventor?). 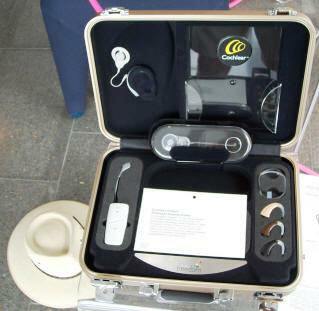 The Bionic Ear has brought hearing to more than 50,000 people in over 80 countries. Begg Orthodontics - During the 1940s and 1950s Percy Begg of Adelaide developed a system of using relatively cheap and lightweight stainless steel braces on teeth to replace the expensive and painful systems which had been earlier used for 'training' and straightening teeth. Begg's technique soon spread throughout the world. The Humidicrib, a portable and inexpensive alternative to the 'iron lung' made from plywood, was invented and manufactured by the brothers Edward and Don Both in Tasmania in the late 1930s as a response to the poliomyelitis epidemic of the time. The invention soon spread across the world and has helped to save the lives of millions of premature babies. Australian surgeon Professor Earl Owen not only designed (in association with optical company Zeiss) the initial suite of instruments used for microsurgery, he has also pioneered numbers of the microsurgical techniques. He is regarded as probably the most important pioneer of microsurgery. Relenza - The world's first anti-flu drug was developed at several institutions in Victoria and released onto the market in 1996. Spray-on-skin for burns victims developed by Dr Fiona Wood and used to great effect after the 2002 Bali terrorist bombings. Discovery of the Helicobacter pylori bacterium which causes stomach ulcers and gastritis leading to its successful treatment. Barry Marshall and Robin Warren made this discovery in 1982 and received the Nobel Prize in 2005 for their work. The world's first vaccine to prevent cervical cancer with the potential to save hundreds of thousands of lives was developed by Professor Ian Frazer and others at the University of Queensland during the 1990s and eventually approved for use in USA in 2006. The vaccine does not act against cancer but against the virus that causes cervical cancer. It was released onto the market in 2006 under the name Gardacil. The Alexander Technique is a set of mental and physical practices developed by F.M. Alexander of Tasmania in the late nineteenth century. It is highly regarded by performing artists for reducing stress and by those suffering back problems. It is now taught in many countries throughout the world. Calyx Drill - developed by by Francis Davis around 1893, this drill was used for drilling large holes in rock and was adopted in many countries around the world because it reduced waste and was highly economical. Flotation Process - the froth flotation process used in the separation of minerals from rocks was developed during 1901-1903 by Charles Potter and Guillaume Delprat of New South Wales. Thrust Bearing - the tilt-pad thrust bearing was invented by Anthony Mitchell in 1905. It is regarded as probably the single most important invention in the world of thrust technology. The self constructing tower crane (also known as the kangaroo crane or jumping crane) was invented by Eric Favelle in the early 1960s. The design allows the crane to increase its own height as the construction proceeds upwards. 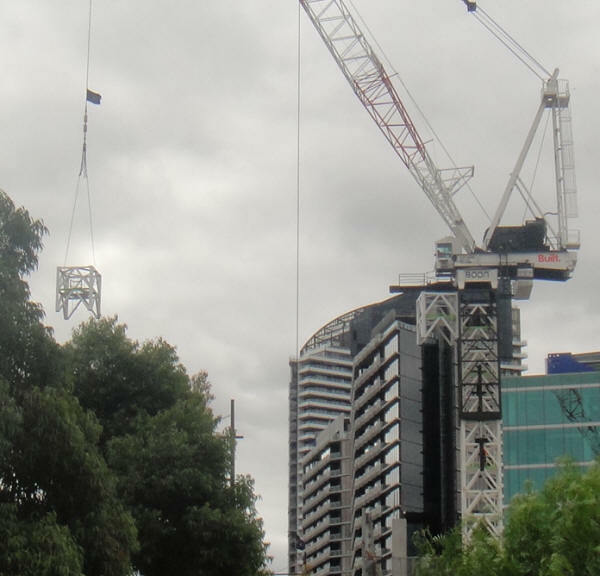 It is this Australian designed crane that has been used for the construction of many of the world's tallest buildings in recent decades such as the World Trade Centre in New York, Petronas Towers in Kula Lumpur and most of the tallest buildings in Dubai including the Burj Khalifa. HIsmelt, a process of smelting low grade iron ore in a way that significantly lowers cost and environmental impact, was a theory put forward by a German scientist in the 1980s. 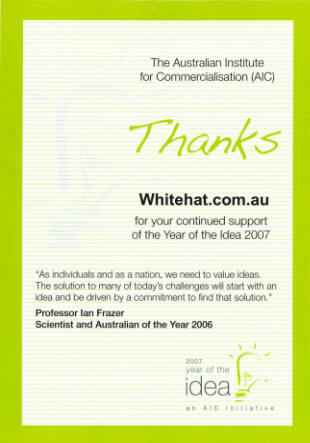 The idea was converted into reality by a group of engineers who created the first HIsmelt plant at Kwinana near Perth. The process is expected to soon be licensed worldwide. The CETO wave energy system was first conceived by Alan Burns in 1975 and this Australian designed and built system was (and currently remains) the first wave power converter to sit on the seabed and requires only a small diameter pipe to carry high pressure seawater ashore to either a turbine to produce electricity, or to a reverse osmosis filter to produce fresh water with zero emissions. The method of creating "smart plastics" was invented by Professor David Solomon and Professor Ezio Rizzardo of Melbourne and by 2011 had led to over 500 patents. This technique of creating polymers has led to many applications including printable plastic solar cells, motor oil additives, superior contact lenses as well numbers of medical and therapeutic applications. Samba software was initially developed by Andrew Tridgell at the Australian National University in 1992 . It enables interoperability between Unix-type systems and PCs and can be found as an important part of most Unix and Linux systems all over the world. Moldflow software - Between 1970 and 1978 Colin Austin developed software that allowed computer simulation of the injection moulding process. This allowed designers of moulds to eliminate much of the lengthy and costly process of test mould designs by trial and error. Today Moldflow software is used by many leading manufacturing companies throughout the world particularly in the area of aircraft and automotive manufacture. DQDB (Distributed-queue dual-bus networks) were invented by Robert Newman at the University of Western Australia in the 19980s. The algorithm combines the combination and distribution of a range of data types across networks and as such formal major part of the communications infrastructure of many cities throughout the world. Uniloc Software Protection was invented and patented by Ric Richardson of Sydney in the 1990s and allows a user to work with a trial version of software and, after purchase, 'unlock' a full version using a registration key. This invention was funded by previous inventions by Richardson including the 'Shade Saver'. The software was copied by Microsoft who later (April 2009) lost an approximate half billion dollar damages award for stealing the technology. At the time the damages awarded were "the fifth-largest patent jury award in US history" . Internet WiFi or Wireless LAN IEEE 802.11 as used in an in virtually all wireless enabled laptops, smartphones and tablets (estimated at 800 million devices worldwide and central to devices such as the Apple iPod and iPad) was developed by an Australian team at the CSIRO headed by Dr John O'Sullivan. Although wireless networks had been around since the 1970s, they were too slow for connecting to the internet. Using a technique known as multipathing which O'Sullivan had developed for radio astronomy, the Australian team developed the most commonly used version of WiFi today. It was patented in 1996 and adopted as the industry standard in 1999. In 2009, after many companies had been using and profiting from the technology without obtaining the appropriate licences, CSIRO won a court case protecting its patent rights on the technology, and recouping the considerable unpaid licence fees from manufacturers of laptops and wireless-enabled smartphones will help finance further innovation projects in Australia. The multi-media entertainment Soldiers of the Cross produced by the Limelight Studio of the Salvation Army Melbourne is regarded as the forerunner of the feature film, and The Story of the Kelly Gang, made in 1906 is regarded as the first feature length film ever made. It ran for more than an hour. Australia can be regarded as the birthplace of the feature film since it continued to produce feature films for another five years before any other country created their own. The Free Music Machine - an electronic music machine invented by Percy Grainger that was the forerunner of modern synthesizers. The Fairlight CMI (computer music instrument) revolutionised electronic music by the way it manipulated sampled sounds. It remains the basis of most electronically produced music today. It was designed by Peter Vogel & Kim Ryrie in 1979. The Cineon Digital Film Workstation - a system that takes an image from film, digitally manipulates it and returns it to film - was developed by a group of engineers led by David Mann (whose name appear on the patent) in the Kodak laboratories in Victoria around 1990. (see more information at Who Was the Inventor?). All computer based video editing software in both professional studios and home computers now use the underlying principles developed for Cineon. Australian Rules Football - Invented in the 1850s (with roots in other games including local Aboriginal ones). In White Hat's opinion the greatest team game in the world. In 1858-9 Tom Wills and others codified the rules and these handwritten rules are reproduced in large format in one of the entry foyers of the MCG. By the time other football styles such as soccer and rugby were codified in their modern form, Australian Rules Football was well established and attracting large crowds to the weekly competition. Callisthenics is a uniquely Australian form of physical culture. It appears to have originated on the Victorian goldfields and evolved over time to the extent that it was included in eisteddfods and school curricula and attracted large numbers of participants. It involves elements of gymnastics, dance, performance art and theatre and often involves the use of rods, clubs, hoops and other equipment. The 'Australian Crawl' - the style of 'overarm' or 'freestyle' swimming stroke now familiar in competition swimming. It evolved out of the 'trudgen' stroke adopted by certain swimmers in Sydney in the early 1900s. The new stroke was soon known worldwide as 'the Australian Crawl' and its most famous exponent (and quite possibly the inventor of its characteristic version) was Fanny Durack. The year 1912 saw one of the greatest ever sporting achievements by an Australian. Fanny, using an Australian Crawl was not only the first woman ever to win an Olympic gold medal in swimming, in the process she cut four seconds of the men's world record. The 'Tote' (automatic totalisator) - was invented in 1913 by George Julius. The automatic totalisator records incoming horse racing bets and automatically calculates and adjusts dividends. Polocrosse was invented in Australia in 1938 and has since become an international equestrian sport. Race Cam - was created in Australia by the engineer Geoff Healey. The winged keel created by Ben Lexcen was famously used in the Americas Cup. Access Class Dinghies - designed and built in Melbourne and now sailed in 15 countries, the Access Class Dinghies were designed to be easy for anybody to sail. Speedo swimwear - the continuing innovation in design make this Australian product highly valued for competition swimming and is often seen as giving Australian swimmers an 'unfair' advantage. We are currently investigating the type of cycling race known as the Australian Pursuit. We do not yet know if it was invented in Australia but its name suggests that it was. The Pedal Wireless - The two way radio powered by a pedal-operated generator was invented by Alfred Traeger in 1927 and quickly became the central tool of Royal Flying Doctor Service and distance education in the Australian outback. The Atomic Absorption Spectrophotometer - this important scientific analytical instrument was invented by Sir Alan Walsh of the CSIRO in 1952. Synroc - a synthetic rock designed to 'safely' store high level nuclear waste was invented by Ted Ringwood in 1975. As this process is regarded as working best after the nuclear waste has had a 'cooling down' period of 25-30 years, this invention is likely to more highly recognised in coming decades. Gene Shears - this discovery, central to much biotechnology was made by Wayne Gerlach and Jim Haseloff at the CSIRO in 1986. The Sensitive High Resolution Ion Microprobe (SHRIMP) which measures the age of small samples of rock to very high accuracy was invented by scientists at the Australian National University in Canberra. The first international sale of a unit was in September 2009 when the University of Granada purchased one for six million Australian dollars. SILEX (separation of isotopes by laser excitation) was invented by Dr Michael Goldsworthy and Dr Horst Struve at Lucas Heights in Sydney. Twenty other countries were working on the technique but had been unsuccessful It allows for the enrichment of nuclear fuel using small, low-cost, energy efficient techniques thus opening up the possibility of cheaper nuclear power, especially for smaller countries. However authorities in the USA were also concerned that it would also make it easier for smaller countries and terrorists to develop nuclear weapons undetected by international regulators and as a result the USA licensed the technology and development in 1999 and 'classified' it in 2001. Often solutions to problems exist but are too expensive or inappropriate for use in remote communities. Australian inventors have come up with simple solutions which are often appropriate in the Australian outback or third world countries. The Coolgardie Safe was invented by A. P. Mc Cormick on the West Australian goldfields in the late 1890s. It is a simple open-mesh food cabinet covered with hessian. The hessian is kept damp by a water tray at the top and the safe is also sometimes placed on a tray of water to stop access by ants. The latent heat of evaporation keeps the contents cooler than ambient temperature outside the cabinet. This simple cooling cabinet could be (and often still is) improvised out of materials to hand. The Icy Ball Kerosene Refrigerator was invented by Edward Hallstrom in Sydney in 1923 and manufactured and distributed by him. For most in the outback at the time it was the only practical form of refrigeration and certainly an advance on the Coolgardie Safe. The Stobie Pole is a form of electricity power line pole suitable for deserts or other regions where trees for the more commonly used wooden pole were not readily available. It was created by the engineer James Stobie and patented in 1924. It consists of cement sandwiched between two pieces of steel which are often railway line offcuts. Stobie Poles have excellent survival properties against a range of natural elements and have become a well-known part of the landscape in South Australia. Buffalo Fly Trap - In 1991 the CSIRO designed a low-tech walk through tent for cows where brushes removed the damaging and irritating buffalo flies from the animal. The flies become trapped in an upper chamber of the tent where they eventually die. Over time the cows realise the comfort benefits and self-clean by visiting the tent unbidden. Sometimes people come up with design improvements which, although not being 'inventions' in the true sense of the word, can be important in their own right. Here are a few Australian ones. The Dual Flush Toilet. Although Australians in water-scarce circumstances have long used a variety of devices to restrict the amount of water used in a flush toilet (including placing a brick in the cistern) the dual flush cistern with two buttons (one for full-flush and one for half-flush) was a design improvement that helped save water. Development of The Bionic Eye is well under way using expertise gained from The Bionic Ear (see above). A team from the Walter and Eliza Hall Institute in Melbourne led by Professor Alan Cowman has developed the first genetically-modified strain of malaria which is capable of being used as a live vaccine against malaria. Trials on humans are expected to begin in 2010. Chinese-born Dan Li came to Australia with the aim of developing a low cost method of creating graphene (a graphite-derived nonmaterial discovered by British researchers in 2004 with great potential for useful applications) and with assistance from teams at Monash and Wollongong Universities and a patent was filed on the technique was filed in 2008. The research continues.